Hello and welcome to Walking the Royal Road, what I hope to be an ongoing series on using the Tarot (or Royal Road, in Aldean parlance) in Blue Rose AGE games. The Tarot has been used in roleplaying games for quite a long time, in a variety of contexts, and with good reason. Reading and deciphering the Tarot is less a matter of divination as it is storytelling—each card carries an intrinsic meaning (and sometimes a second meaning when the card appears inverted) that can serve as a building block for a larger narrative. When multiple cards are laid out, with each card position also having a meaning, it is possible to use them to build a small story of some kind, through the language of symbolism and the very human act of pulling disparate elements into a larger narrative. The Blue Rose AGE core book already suggests a use of the Royal Road: in the establishment of a character’s Calling, Destiny, and Fate. There are also some suggestions for using tarot in Chapter Ten (p. 313, in the section “Walking the Royal Road,” where the title for this series comes from). This series of articles is going to suggest some additional uses for them. The cards we use in these articles are the Shadowscapes Tarot, with art by the amazing Stephanie Pui-Mun Law, whose art has graced the covers of Blue Rose books throughout the game’s history. Today’s article is going to offer some additional character building. Romantic fantasy, as a genre, focuses not just on magic and feats of derring-do, but also the relationships formed by the characters. Characters do amazing things for love, for friendship, and for hate, and these kinds of motivators should always play into games of romantic fantasy, to some degree. In order to have these kinds of motivations, though, player characters need some relationships in place. This system is intended to augment the Relationships mechanics, as found on p. 60 of the Blue Rose core rulebook. Where that system helps define how strongly heroes feel about other characters, this one will help with the brainstorming of figuring out who they are. The spread for this method is a simple three-card spread for each character. The Role Card indicates in what capacity the PC knows the character in question. Take a look at the suit (pentacles, cups, wands, swords, or Major Arcana). Pentacles: The person is someone you know in a professional capacity. Cups: The person is someone who know familially, either a member of your family, or someone you met through a family member. Wands: The person is someone you met in a social capacity, at a party or festival, tavern or theater. Swords: The person is someone you know from a training or learning endeavor: a fellow apprentice, or someone you met in schooling of some kind. Major Arcana: You met this person in some extraordinary capacity. Use the card itself as an inspiration: perhaps you met the Chariot while traveling, or you met the Tower during a terrible disaster of some kind. The Personality Card indicates what this person is like. Use the tables for Calling, Destiny, and Fate in the Blue Rose core rulebook as a starting place. Note that this card does not indicate this character’s Calling, Destiny, or Fate—it’s simply what their outward-facing personality is like. There are always depths beneath this surface. The Relationship Card indicates what your relationship with this person is like. The meaning of the card should be applied to this in some capacity. A Six of Wands suggests recognition of success, so perhaps this person looks up to you for your heroism; in contrast, the Page of Swords is about having enthusiasm but needing more information, so this card in the Relationship space suggests that the person looks to you as a source of information, or is themselves such a source for you. 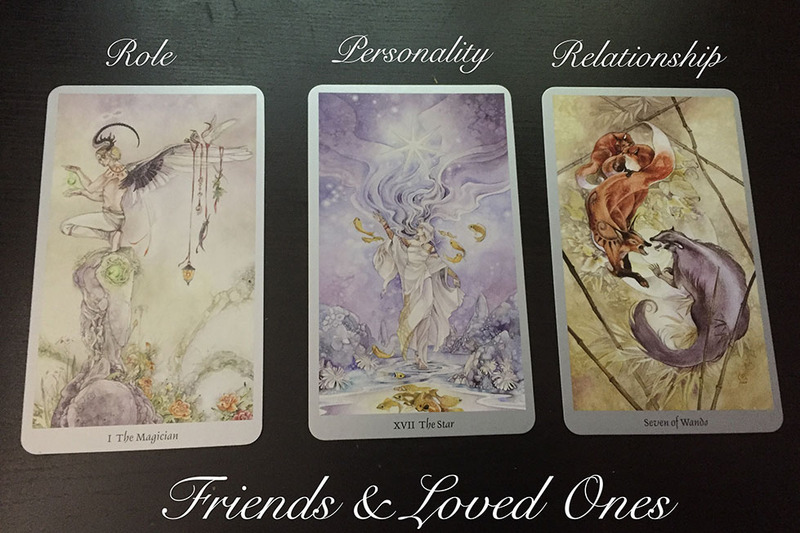 In the image, we have laid out some cards in the Friends & Loved Ones Spread. Role: The Magician. We know this person because of magic, clearly. They might be an adept of some kind, or if we’re playing an adept or other talented character, perhaps we aided them with our own arcane arts. Personality: The Star. Consulting the Callings table on p. 57 of Blue Rose, we see that this card represents “Artistic Mastery.” This character seems to be an artist to everyone they know, and not just a dabbler, either, but someone who really works to master their craft and achieve their vision. Relationship: Seven of Wands. One of the typical meanings for the Seven of Wands is both aggression and defiance. In the Relationships space, this suggest someone whose closeness to the player character is either defiance—or, it’s someone who maintains the relationship out of defiance. Here is just one example of a Narrator character generated using the spread above. It’s far from the only one, to say nothing of the variety possible from other card results entirely! Godia Tulry: The Wishful Scrivener. We met Godia in the way she tends to meet new people—when she barged right up to us to ask us about our experiences and theories about the arcane. The other adepts roll their eyes and make themselves scarce when she shows up, because she’ll take up every bit of your time, if you let her. Despite their warnings, though, we find her delightful. She’s a dedicated magical chronicler, and we’re good enough friends that she has shyly confided that she wants more than anything to wield magic herself some day, but she just doesn’t have the Talent for it. Still, she is very sweet, loves when we use magic around her, and whipcrack sharp when it comes to arcane theory and history. In the above example, magic is at the center of the friendship between Godia and the player’s character, per the Role card showing the Magician. Her insistent personality around her craft we derive from the Personality card showing the Star, and we’ve interpreted the defiance in the relationship, per the Relationship card showing the Seven of Wands, as coming from others who don’t understand the friendship. Thanks: To Stephanie Pui-Mun Law for her amazing Shadowscapes tarot, which we use in this article. Her deck can be purchased off of Amazon here. Joseph Carriker is a game developer for Green Ronin, responsible for the Blue Rose AGE line, as well as working on other games such as Fantasy AGE and the Critical Role: Tal'Dorei Campaign Setting books. He has worked in the gaming industry for over eighteen years, including doing work for Wizards of the Coast, White Wolf, and Onyx Path Publishing during that time. He is an outspoken queer gamer, having helped found the annual Queer as a Three-Sided Die panels at Gen Con and other conventions. He is also novelist, with his first novel, Sacred Band, about a team of LGBTQ superheroes, garnering starred reviews from Kirkus Reviews and Publishers Weekly. His second novel, Shadowtide, is set in the Blue Rose setting, and is available from Nisaba Press. Joseph lives in Portland, Oregon with his fiancé A.J. Pre-Order and PDF: The Book of the Righteous for Fifth Edition Freebooters Ahoy! The Changing of the Guard.